Date : Italy, Florence ca. 1490. Size : 16.5 x 11.4 inches. / 42.0 x 29.0 cm. 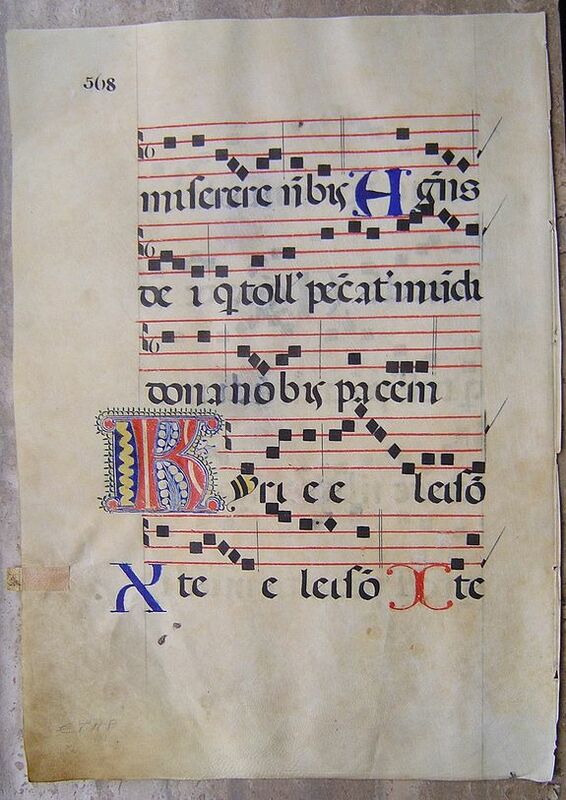 Large leaf from a Florentine Gradual, on vellum, written in black ink, with 5 lines of 4-line musical staves. The gradual, the name derives from the practice of singing the gradual on the steps of the raised pulpit.It is the principal choir book used in the mass, arranged according the liturgical year. RECTO: The text is of the "Agn(u)s dei..." two coloured capitals in red and blue. VERSO: The text on verso is of the "Kyrie ...", with a very large capital K in red with infilling of blue and yellow. The leaf has a stab to allow an easy finding of the text for the priest. Condition : The leaf is vellum and nice flat, in very good condition, wide original margins. Slight thumbing of use at right-hand bottom corner. Very clearly written and the black ink without any fading.